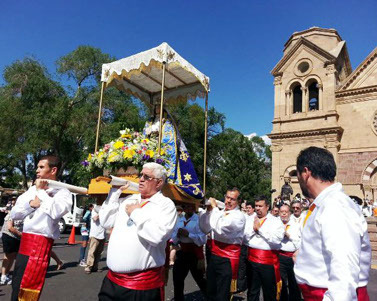 During the weekend of September 5-7, 2014, Santa Fe’s biggest celebration begins; a celebration over 300 years old. Santa Fe, New Mexico is a historic capital and one of the oldest in the United States. It was established by Don Juan de Onate at San Gabriel in 1598 and moved over 30 miles south to the foot of the Sangre de Cristo Mountains, where Santa Fe was founded in 1610. In 1680 the Indians revolted, burned the city and drove out the Spanish colonists, who fled to what is now Juarez, Mexico. Before fleeing, the Spanish colonists rescued from the burning church the 29-inch wood carved Marian statue, La Conquistadora, originally brought to Santa Fe in 1625 by the missionary, Fray Alonso de Benavides. Twelve years late, the King of Spain appointed Don Diego De Vargas to join the other colonists in Guadalupe del Pasa and organize a campaign for the resettlement of Santa Fe. He accomplished this difficult and remarkable mission without bloodshed on September 4, 1692. In December of the next year, the Indians resisted when De Vargas returned from a trip to recruit more colonists, so he set-up an encampment outside the city near the present site of the Rosario Chapel. De Vargas placed La Conquistadora on a makeshift altar and implored her to intercede for the successful re-entry into the town. Before the end of December 1963, De Vargas had led his triumphant forces back into the City of Holy Faith where La Conquistadora was likely enshrined temporality in the Palace chapel. Crediting the Madonna’s intercession with his victory, De Vargas is said to have vowed restoration of her throne in the parish church built by Fray Benavides in 1692 and destroyed by the Indians in 1680. Unfortunately, De Vargas died on April 4, 1704 without achieving this goal. Eight years following the death of De Vargas, Lt. Governor Paeza Hurtado, a Captain and a close friend of De Vargas, influenced city officials to draft a proclamation for an annual celebration commend orating the peaceful 1692 resettlement. 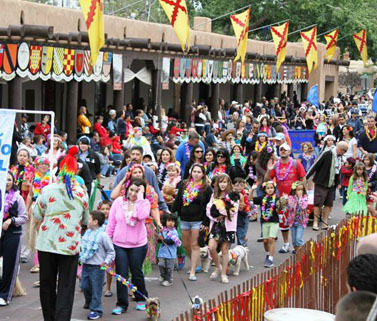 The 1712 proclamation establishing the first Fiesta de Santa Fe, was signed by Governor Marquez de La Penuela. 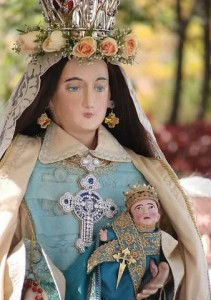 La Conquistadora is among the most venerated Marian figures in the world. She was crowned in 1954 by Cardinal Francis Spellman and again in 1960 by an apostolic representative of Pope John XXIII. Her golden crown is studded with precious stones, including a three-carat diamond. And so it is that La Conquistadora, a conqueror of hearts, and De Vargas, a conquistador of the new world, join forces to inspire our unique and enduring celebration, la Fiesta de Santa Fe, a time of prayer, rejoicing and hospitality for all. 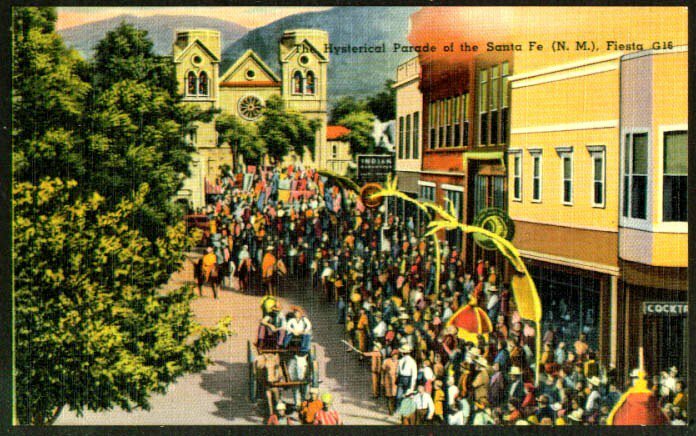 Thank you to SantaFeFiesta.org for the incredible history. 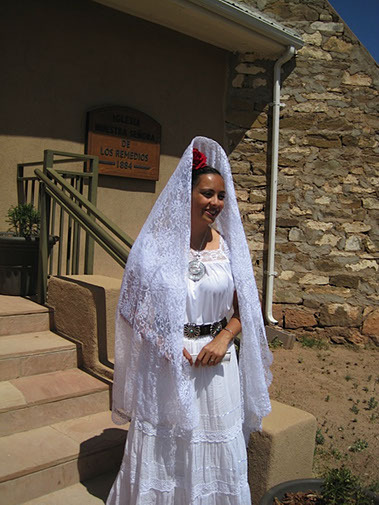 This entry was posted in Uncategorized and tagged City of Holy Faith, don diego de vargas, fiesta de santa fe, History of Santa Fe, New Mexico, Santa Fe, Santa Fe Festivals, Santa Fe History, What is the meaning of Fiesta de Santa Fe?. Bookmark the permalink.